Boarding the ferry in Horseshoe Bay, your journey to the Sunshine Coast really begins. For forty minutes you will be enchanted by the scenery of fir and cedar treed islands against a backdrop of coastal mountains. 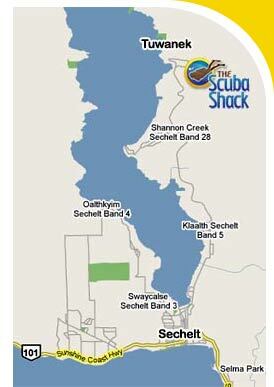 After docking it is a twenty-six kilometre drive on Highway 101 to the town of Sechelt. On the way you pass the fishing and beach combing village of Gibsons Landing, the 'gumboot' community of Roberts Creek and the self-governing Sechelt Indian Band to Sechelt with it's cafes, coffee houses and pubs. 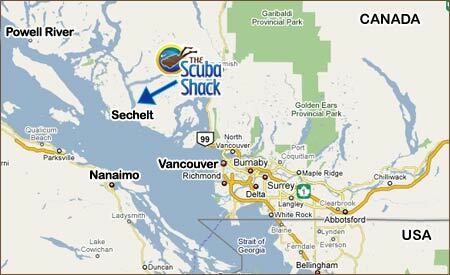 From Sechelt it's a short drive along the water to The Scuba Shack. Entering Sechelt you come to the third set of lights: turn right onto Wharf Street. Continue along Wharf Street for four blocks and turn right onto Porpoise Bay Road (this road turns into Sechelt Inlet Road). 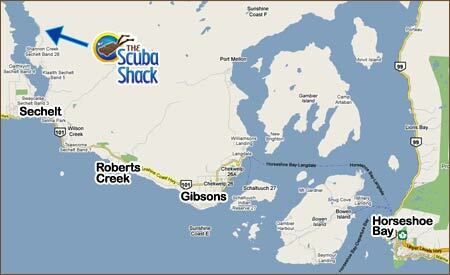 MAP: The Scuba Shack is located at 5687 Upland Road, Sechelt, BC. Travel north for 9 kilometres past the Porpoise Bay Provincial Park and the local community of Sandy Hook. 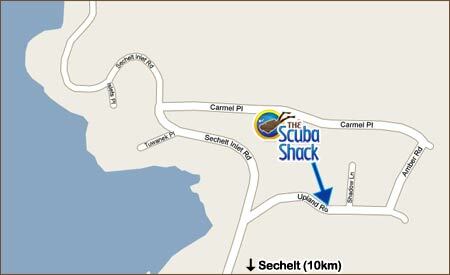 The Scuba Shack is located in the uppermost community of Tuwanek at 5687 Upland Road.